Need to fasten your wire rope together? Our wire rope grips are a strong and effective way of securing your rope. Our wire rope clips are a quick, easy and reliable way of securing your wire rope. Each clip is made up of a cast steel Saddle, a steel U-bolt and two nuts before being hot dipped galvanised. 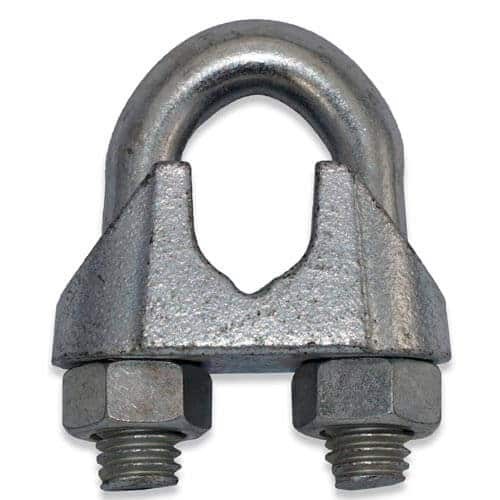 This ensures a strong and rust resistant wire rope clip. Our clips come in a variety of sizes to suit different wire diameters. It is always important to make sure that your wire rope clips are installed correctly. Here are is a general guide to installing your clips. 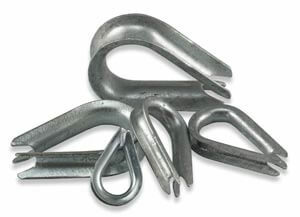 Your wire rope clips are free from cracks, nicks or gouges. Your clips have not had any repairs or reshaping done to them. You clips are the correct size for the wire your are installing. Once you have looped your wire rope through you the eye of your turnbuckle or similar, turn back a length of wire. 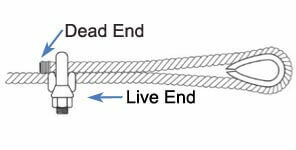 Clip your first wire rope clip one saddle width from the 'dead end'. Seat the 'live end' (the end that continues on) of the wire rope in the saddle of your clip. Position the U-bolt over the 'dead end' and fasten it into the saddle by tightening the nuts fully. Place your second clip as near the loop as possible. Install the U-bolt and tighten your nuts firmly, but do not completely tighten them. Equally space the remaining clips evenly between the first two clips. Install the nuts firmly, but do not fully tighten them. Apply tight tension to the wire rope to take up any rope slack and then tighten all the nuts evenly to hold the rope firmly in place. To ensure you get the maximum strength and reliability from your clips, make sure you install your clips so the saddles of your clips are contacting the 'live end' and not the 'dead end' of your live rop. The U-bolts should loop over the 'dead end', not the 'live end'.